Very interesting. I’m going to guess that you would be concerned about the removal of interaction between older fish and younger fish… perhaps (I’m not an expert in marine biology, so bear with me) a necessary element to sustainable biodiversity under the seas. If all the large fish are caught leaving only small fish, we would end up with diminishing populations of large fish… perhaps eventual extinction. Another concern is of a Darwinian nature… if those nets only catch large fish, then it stands to reason that over the long-now time period, fish would evolve as smaller by nature to adapt to the danger of the large fish catching nets. Am I close? Absolutely. I love the evolution angle in the long-now time. If these small fishes do survive and our fishing practices remain the same then they might adapt to remain small in the future. Like for instance the coral reefs which apparently disappeared for hundreds of years to adapt to a given situation only to reappear when more favorable situation came up. Thanks so much for the beautiful thought provoking contribution to the dialog. I also realize that there is no one reality and there is no end to anything. Reality is laid layer by layer. At times we see some layer and miss the rest. And nothing ends. The end of something is the beginning of something else. At this point, the fish in the ocean are being depleted at a rate which is unsustainable. There certainly is an intelligent justification for these nets, as we’d want young fish, or smaller fish that might serve as food for larger species to survive. But I also agree with Sean, in that we should consider how these nets would impact the relationships between various fish in the ecosystem. Fact is, the world could use a lot more vegetarians. Not that the consumption of fish is atrocious, in fact I’ve recently begun to eat fish again, but we could use better ways of farming the species. My preferred solution would involve more urban and peri-urban aquaponic systems whereby fish are an integral part of the closed system that also supplies a variety of vegetables. Such technologies can be monitored and replenished regularly by urban farmers. Thanks for your contribution to the dialog. Rate of adaptation is an important issue. The blind dolphins of China are now extinct since their rate of adaptation to the steamer plying the river was way behind the rate needed for survival. Loved the idea of the aquaponic systems. In fact there is a natural hidden link between fishes and vegetation, very systemic. I wrote about this long ago in my blog. You may find it interesting: http://dibyendu.posterous.com/fish-rice-a-fishy-twist-in-the-tale Unfortunately we are ignoring this basic natural interaction. 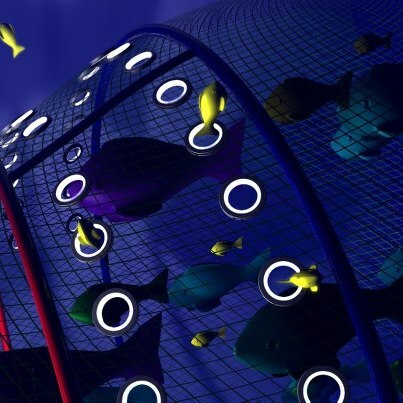 So, I was basically suggesting that overfishing presents a pretty serious dillemna which this net might help mitigate, but I’m not sure if it will entirely solve. I was agreeing with Sean, that we might consider how these nets would impact the relationships between various fish in the ecosystem. Then I brought up aquaponics as an alternative and presented a link to an example worth considering. http://bit.ly/UQrGSe This would cause far less harm to the environment as it’s a separate, closed system, that could potentially scale in ways that could render conventional fish farming far less necessary. True – we need to be highly aware and conscious. Your idea can easily be an idea for many social entrepreneur start up in various ways. Tilapia, the one your referred to, is incidentally a very common fish taken by Bengalis (people from Bengal) in India. I think here the case needs a different consideration. Water hyacinths is a menace in Bengal and other places as it chokes up water reservoirs in no time and stifles marine life. It is only the adult tilapia fish which can combat this ecological menace and save water resources and the ecology of such reservoirs. So, I think in this case our consideration might be slightly different. Take smaller tilapias (not the babies) and the extra large one too and leave the big ones alone. What strikes me that even this issue of environment and sustainability is so tricky to deal with. No one formula would work around the world. It is so context sensitive for which decisions have to be based on the local reality of a place. That might make this issue of environment and sustainability quite complicated. No? You say “I think here the case needs a different consideration. ” It may be impossible to resolve the paradox of sustainability without a deep understanding of the context. What might work in one situation might be just the opposite in another. One approach is to define possible scenarios. Once defined minimally invasive interventions and constant monitoring as the new situation unfolds. As things move some scenarios will become increasingly unlikely. Would suggest further careful interventions to move the system in a good direction. I completely agree with the method you propose. 3. Pick the most likely scenario to confirm the likelihood through minimally invasive intervention (design) good enough to create a desired change and then keep adapting informed by monitoring and implementing further minimal interventions as needed (if likelihood is not confirmed move to the next likely scenario and repeat). When playing the Fishbanks Simulation, many policies are tried for making things better with the fish population (and the fishing industry). And most of them just pushed the problem to the future, or worsened it. And this was just with a very simple structure, imagine what happens with a complex adaptive system! I concurr with the idea that innovative solutions should be undertaken. Applying substraction might help. What if we took fish from our radar? How would we replace it in our diets? How would we help their population and all other interdependent natural ecosystem benefit from that substraction? Thank you for the contribution to the dialog. Yes, I do love the ‘subtraction’ method of SIT. Would you think that it would aptly address the issue of ‘minimal intervention’ as stated in point 3 in my reply to Michael Josefowicz (@toughloveforx)? Yes, it not only makes lots of sense but also very useful . I loved this portion of your comment, “filtered by feasibility and ordered in descending order of systemic leverage”. That gives innovation more logical structure when it comes to implementing choices generated through innovation. May be this structuring in descending order of systemic leverage might be further informed by the minimal intervention experiments. No? There was an interesting clue for something I’d not thought of before. We tend to look at this problem from the perspective of us being the only ones depleting the fish. We forget about all of the other natural predators of the fish (who naturally do not follow any concerns for size — well, maybe they do). The other thing that we have not considered here are temporary imbalances. It is entirely likely that there may be periods, where human existence would depend on the near depletion of a species. We just have to make sure that this is the case and that our ’cause’ is noble. The bottom line is that we have to understand that we have been given stewardship over these resources and we have to use them wisely. The earth is not intended to last ‘forever’ — it was designed that way. No matter what we do, we cannot thwart that purpose. Yes, I do agree that in this case the innovator has overlooked the fact that small fishes might be gobbled up by big fishes (predators) when they are left unprotected by the guardians/bigger fishes of their own species. I am given to understand that every year we lose something around 10,000 species of different kinds across the world. I suspect that this might be one of the reasons contributing to such a fast rate of depletion. Your consideration of ‘temporary imbalances’ is interesting. That might help us to explain the sudden disappearance of many coral reefs across the world for many years followed by their surprise re-appearance once the right conditions for them to thrive is reinstated. This perhaps gives us some hope that all so called ‘extinct’ species might not have completely vanished. There might be a chance of them coming back once right sustaining conditions are there for them to thrive. I agree that wisdom is needed. But that can be easily replaced by money considerations. That might be the single most important reason why alternative energy sources are not being explored and developed to make alternative energy affordable for most. I find it very hard to believe that the US (or other developed nations) with its mighty innovative and technological powers hasn’t yet come up with viable alternatives of cheap, clean energy. You are absolutely right there.For some big nations it might be important that other nations use up their energy sources and hence are absolutely dependent on the bigger one for help.A power game. What do you think of adding “look at the processes that have resulted in the present situation? and look at the various reactions that players have made to those processes. My point is that the most likely future is the result of the same processes that happened in the past. What is helpful is to choose the appropriate time frame for seeing the processes. I tend to like looking at things first in a 5000 year time span. In that frame the most likely future scenarios for climate change is that the earth will evolve and humans will evolve to live in the new reality. As the costs of climate change impinge on those with power, my bet is we are approaching an inflection point in a deluge of new technologies most likely solar energy. It will be interesting to watch the US now that New York City, still the center of the american media has experienced Sandy first hand. It’s significant that Mayor Bloomberg and the Governor of New York State, have now put mitigating the effects of climate change in the public agenda. This is specifically not to say that the consequences of these massive changes will not cause much dislocation and heart ache. Merely to say the “end of the world” discourse present in so many places is not appropriate or helpful. Michael, I agree to you suggestion, ‘look at the processes that have resulted in the present situation? and look at the various reactions that players have made to those processes.’ That is what creates new situations. And if it is left unexplained the future would be no different from the past and the present. The future is enfolded into the past and present only to unfold as we go along mindlessly. Agree “‘end of the world” discourse present in so many places is not appropriate or helpful.” It is plain meaningless. Nature as a creative adaptive system would continue to do what it wants to do. It is up to us to be equally creative to adapt. We are neither the masters of the universe nor the center of it. Wishful thinking merely does not count. Thank you for the notion of subtraction as an approach. I’ve seen it play it out in the conversations about education in the States. The fact, as I see it, is that teachers have no time in most schools to have the collaborative meetings that have shown to be effective again and again in many contexts. I firmly believe the most effective intervention to “improve” schools – given the constraints of the situations today – is to remove unnecessary tasks from a teacher’s responsibility. It’s my conjecture that the particular quantity one chooses is much less important to track processes than the fact they are consistent and can be gathered in as close to real time as possible. There is much talk about High School Dropouts in the States, and as I understand now an issue in the EU. The fact is that the single most predictive factor for a kid who is going to drop out is absence from school. If that information were gathered in real time, any significant change in a student’s attendance patterns could trigger a more personal intervention. This may be perhaps the most important thing when looking at complex creative systems. To do an intelligent scenario planning we have to be able to See the situation through the lens of all the players. From my experience the tricky thing is to appreciate that our views as change makers is as defined by our life situations as much as any of the players. I like to look at it as the issue is never why are people are wrong. Rather the issue is to understand why they are right given what they see. At the greatest scale anthropomorphism and an anthrocentric point of view, causes us to miss many of the processes that are in play.